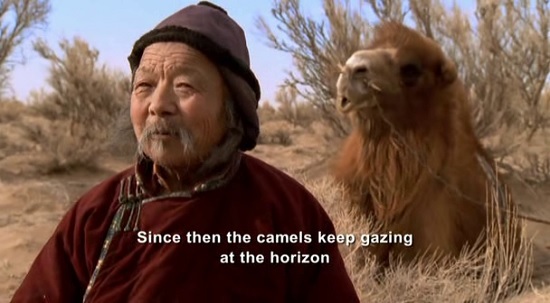 Blurring the lines between fiction and non-fiction, Byambasuren Davaa and Luigi Falorni’s ‘The Story of the Weeping Camel’ documents a nomadic Mongolian sheepherder family’s efforts to compel a female camel to allow her rejected newborn to suckle. Where those lines are located, however, ultimately matter very little, as the directors’ majestic, clear-eyed depiction of the bonds between parents and children – with regards to both the film’s two- and four-legged protagonists – is stirring regardless of whether certain moments have been artificially staged. During spring, a family of nomadic shepherds assists the births of their camel herd. The last camel to calve this season has a protracted labor that persists for two days. With the assistance and intervention of the family, a rare white calf is born. This is the mother camel's first calving. Despite the efforts of the shepherds, the mother rejects the newborn, refusing it her milk and failing to establish a care-bond with it. To restore harmony between the mother and calf, the nomadic family calls upon the services of group of lamas who perform a ritual with bread or dough 'effigies' of the mother, the calf and the individual members of the family. The rite opens with the sound of a sacred conchshell horn followed by bells in the hands of lamas, some of whom wield vajra. The rite takes place with members of the extended nomadic community and a number of lama at a sacred place that consists of one end of a log, or wooden pole, set in the earth, with the other end raised to the sky: a stylized 'victory banner' (Sanskrit: Dhvaja) with a piece of blue fabric entwined around it, functioning as a prayer flag (darchor-style). The log is supported by a cairn of rocks at its base as foundation. The ritual, however, does not re-establish harmony between the mother and calf. The family then resolves to secure the services of an indigenous 'violinist' to play the music for a Mongolian 'Hoos' ritual. They send their two young boys on a journey through the desert to the community marketplace to locate a musician. 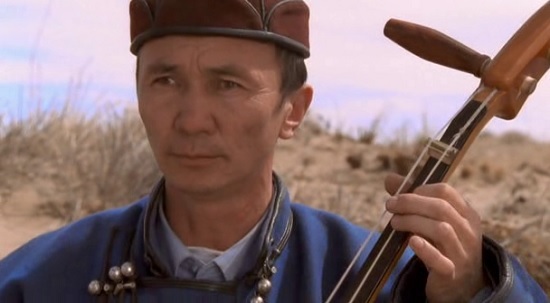 The 'violinist' —who plays more precisely a morin khuur — is summoned to the camp and a ritual of folk music and chanting is enacted. The musician first drapes the morin khuur on the first hump of the camel to establish a sympathetic magical linkage between the mother and the state of harmony represented by the instrument. Once this is done he removes the instrument and commences playing. 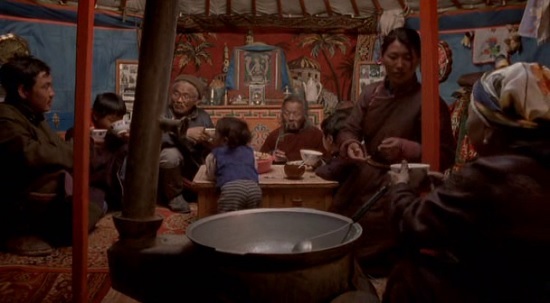 As the musician sounds the Mongolian 'violin', the female family member who lulled her child to sleep with a lullaby earlier in the documentary, repeatedly intones the calming sounds and beautiful melody of the 'hoos'. 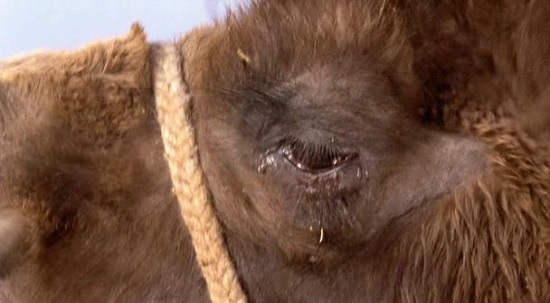 At this point, the mother camel starts to weep, tears visibly streaming from her eyes. Immediately after the rite the mother and calf are reconciled and the calf draws milk from her teat. The movie is filled with many spellbinding moments. Mothers wash sons before delivering their camels’ calves, while an introductory fable about why the titular animal stares off into the horizon (answer: because it’s waiting for the deer to come back and return the horns it borrowed) casually speaks to the sheepherders’ position as the final remnants of a fading breed. As epitomized by two boys' trip to a market where they observe (and the little one is entranced by) modern goods like computer games and television cartoons, the disconnect between the contemporary and the archaic resonates throughout ‘The Story of the Weeping Camel’. And in scenes such as one of a ritual in which a musical instrument played against the mother camel’s side brings her to tears, the film exudes a subtle spiritual power, just as a climactic juxtaposition of animals and humans joyously sharing milk epitomizes the directors’ tender, compassionate portrait of the primacy of familial bonds. Co-directors Byambasuren Davaa and Luigi Falorni knew a little of anguish and frustration themselves during the making of Weeping Camel. After two weeks and 4,000km of travel in Gobi, they found the perfect family to channel this folkloric tale: four generations living together in one camp, including wise-and-wizened oldsters, young parents with movie-star looks and effortless grace, and three appealing children. "We fell in love with them all immediately. They were beyond our wildest expectations," said Falorni in an interview. Falorni cited the inspiration and influence of pioneering documentarian Robert Flaherty, whose landmark film Nanook of the North (1922) recorded the often sensational everyday lives of an Eskimo tribe. In essence The Story of the Weeping Camel charms audiences of all ages with its family values while supplying sufficient cultural material to educate without preaching. Universal themes about gaining trust and developing healthy relationships dominate while the contrast between traditional life and progressive modern lifestyles looms. After all, young Ugna is fascinated by television and the ominous presence of a satellite system is seen during the closing credits. Once again the question remains on how long traditional indigenous lifestyles can withstand the encroachment of the modern world, but this crowd pleasing film unobtrusively allows us a worthwhile 90 minute experience in the old ways. Thanks for the touching narrative.So well presented,sir.Regards.